The Oakland mausoleum is leaving its annual jazz series behind in pursuit of more musical variety. Jazz should still fill this room — just not six times a year. 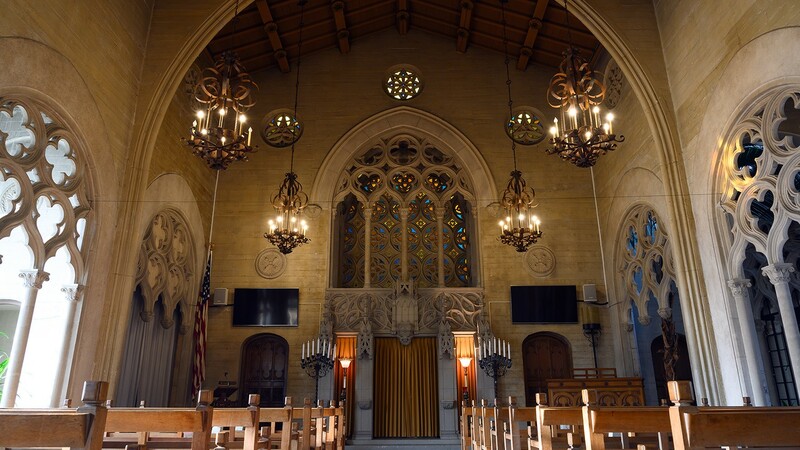 Earlier this month, Mary D'Orazi brought a sold-out crowd to Oakland's Chapel of the Chimes, eager to witness the hypnotic sound of two-time Grammy Award-winner Mads Tolling. She's been curating similar shows at the Piedmont Avenue mausoleum — and architectural marvel — for nine years, but the Tolling event was her grand finale. "I really didn't want to lose it," she said. "It's sad because I enjoyed doing it, and the venue was really nice, and there's a lot of people who are going to miss it." Last month, Chapel of the Chimes General Manager Nickolas Marinelli decided to discontinue the venue's contract with Jazz at the Chimes, the series D'Orazi has organized off and on since 2006. It's disappointing for D'Orazi and the loyal following she's built — just about every Jazz at the Chimes event has been a sell-out, she said — but Marinelli is ready to debut a new vision for live music at the chapel. "I feel that when we put on an event, it needs to not only benefit a small part of the community — for instance, people who like jazz — but basically, the entire community," said Marinelli. In addition to having a wider variety of folks exploring the Chimes, Marinelli wants more people to benefit from the music series — not just the people who attend and the artists who perform, but the community at large. His plan is to find an Oakland nonprofit to link to every event — the nonprofit would provide volunteers for staffing and also receive the proceeds. "My dream is six times a year, we can do this and six nonprofits would get money that would normally go to just one person to produce it." Instead of paying D'Orazi to put on Jazz at the Chimes, Marinelli will produce the new series himself. In January, Marinelli will debut Music at the Chimes, starting with a cello quartet. He emphasized that jazz isn't leaving the venue forever. ("I do want jazz. I like jazz. But I do want to have a mix.") He's interested in bringing in anything from classical to hard rock throughout the rest of 2019. Beyond the much more varied musical genres, folks shouldn't notice a huge difference between Music at the Chimes and Jazz at the Chimes. It will still take place six times a year on Sunday afternoons, and ticket prices will stay around $15 or possibly be lowered. And, of course, the setting and acoustics will be magnificent. That setting is one D'Orazi felt was particularly excellent for jazz, and a place where Bay Area musicians have loved playing. "It's just a great environment for them because it was a pure listening environment, with people sitting there and actually listening to them perform — not being in a club or a cafe where there are drinks and people talking," she said. She doesn't plan to move her local jazz series to a different venue. "I think the whole thing for me was that it was a lovely place, and they were very much behind it, and it was very unique," she said, referring to past managers. "I felt very grateful for that. It's not something I can easily take somewhere else." Beyond jazz, Chapel of the Chimes is known for hosting Garden of Memory, the annual summer solstice celebration that brings dozens of experimental musicians and sound artists to different nooks of the maze-like mausoleum. Garden of Memory's organizers confirmed it's still on for Friday, June 21 next year, but Marinelli said it might look a little different. He's dedicated to organizing a new Juneteenth event at the Chimes, and since Juneteenth takes place just two days before Garden of Memory, he's thinking about merging them. Ideally, Garden of Memory would continue as usual inside, and a Juneteenth street festival would take place outside. ("Our clientele is predominantly African American, and I was shocked to find out there's not a Juneteenth event," he said.) He's still ironing out the details but likes the idea of "everyone getting mixed together." Similarly, the schedule for 2019's Music at the Chimes hasn't been finalized yet. Marinelli is welcoming music suggestions from the community.